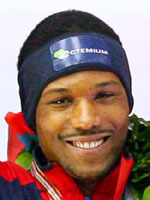 The first black athlete to win an individual Olympic medal at the Winter Games by taking the 1000m speed skating title, American Shani Davis had a real struggle to get to the top, but has sat there comfortably ever since. The Chicago native now targets more Olympic titles when he will be a strong favourite in both the 1000m and 1500m races, the latter of which he has dominated in recent seasons. His 1000m gold medal was little surprise having set the world record heading into the Games and he also added silver in the 1500m behind Italy's Enrico Fabris who edged Davis by just .17secs. Since Turin, the American has wasted little time in taking his achievements to another level, setting four world records and winning six world titles. Such are his impressive statistics that by the end of March 2009, he stood at two Olympic medals and 14 world championship medals, including eight golds. Davis was brought up by his mother in Chicago and quickly showed such talent on roller skates that he was adjudged to be a security risk for those skating around him. Then came the switch to speed skating and already as a youngster he was under a strict training regime as the rise to the top began. He went on to win a string of junior awards before trying to become the first man to qualify for both the short and long track events at Turin, but missed the short-track team by a single place at the trials. Fun loving and with a smile never far from his lips, Davis has however enjoyed his fair share of controversy after rows with the US Skate federation over a personal sponsorship deal and an accusation that allies fixed the 2002 short track trials to get him on the Olympic team. The accusation was eventually dropped but Davis says the episode tainted his Salt Lake experience, at which he ultimately missed the relay event. At 6ft 2in and 185lb (1.88m 88kg) his physique is better suited to building up momentum on the bigger track and he took the 2004 1500m gold medal before racking up the 2005 and 2006 all-distance crowns. On top of that he was world champion over 1000m in 2007 and 2008 and 1500m champion in 2007 and 2009. Add to that three World Cup crowns in the 1000m category (2006, 2008, 2009) and two 1500m titles (2008, 2009) and it is easy to see why he is the man to beat at Vancouver. There was more controversy at Turin when teammate Chad Hedrick, who was chasing five gold medals, accused Davis of weakening the US pursuit team in order to concentrate on his individual races. As an African-American, Davis has also faced a series of typically depressing challenges with racists, he was also ridiculed by his childhood pals in Southside Chicago, where football and basketball were more popular than the ice rink. He will be 27 when the Games take place on the West Coast of Canada and at the peak of his powers in a fresh bid for more Olympic glory.